SIOUX FALLS, S.D. - The Catholic Diocese of Sioux Falls points to the timing of the Notre Dame fire, as giving some hope in the midst of a terrible tragedy. "It's Holy Week. We know we are going to experience Good Friday. But we also know, we are fortunate to know, that Easter follows, the Resurrection follows." Spokesman Jerry Klein believes that the authorities will be quickly talking about how to bring Notre Dame back. Klein says he and his wife attended mass at the historic Cathedral back in 2014. He calls it an unbelievable place. The tragedy hits home at the University of Sioux Falls, to long-time Choir Director, Dr. David DeHoogh-Kliewer. DK, as he's known to most everyone on campus, took the choir to sing at Notre Dame in 2012. "It is just shocking to think that something of that beauty could be destroyed so quickly." DK remembers the wonderful acoustics in the great cathedral surrounded by so much beauty and history. He's stunned to think of all the wooden choir stalls, where the USF Choir performed, now likely destroyed. 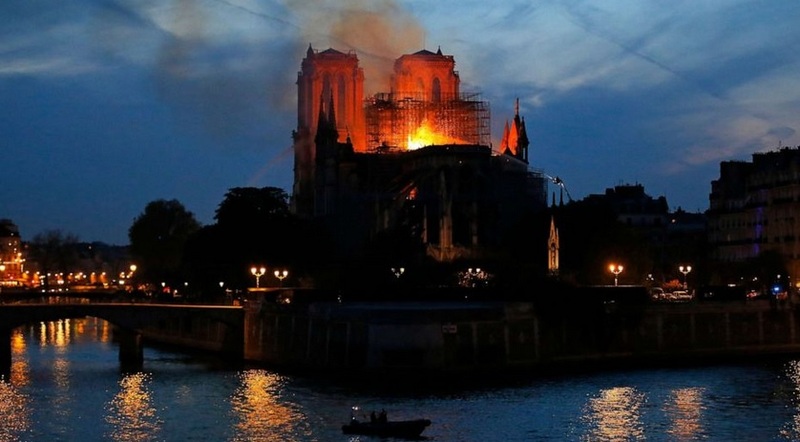 The fire chief in Paris says his crews managed to stop the flames from reaching the belfry and prevented a catastrophic collapse. Fire officials say one firefighter was injured. Paris Mayor Anne Hidalgo says the significant collection art work and holy objects kept inside the church has been recovered.